The Colombo Fort Magistrate this morning rejected the second bail application made by National Freedom Front (NFF) leader Wimal Weerawansa. Weerawansa had cited his 15-year-old daughter's mental health as an exceptional circumstance to be released on bail. He is being held for allegedly misusing 40 vehicles belonging to the State Engineering Corporation (SEC), while functioning as the Housing, Construction and Engineering Services Minister. The vehicles that were released for the use of friends and family had incurred the government an estimated loss of Rs. 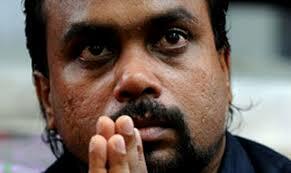 91 million.Weerawansa was arrested on January 9. He began a hunger strike in protest of the Court of Appeal rejection of his bail application on March 21.On March 25, MP Weerawansa was taken to the Prison Hospital.On March 30 he was transferred to the National Hospital where he ended his 9-day fast.